I initially created this recipe below to use up some fresh cranberries I had on hand from the winter holidays. But my husband and child loved it so much that I’ve made it a few times since, including taking it to potluck meals. This is a great recipe to involve your preschooler or older child in, as it’s easy to make and is ready to eat in no time. My preschooler had lots of fun helping me pierce each fresh cranberry with a toothpick! Vegan, egg-free, dairy-free, gluten-free (if gluten-free oats are used). A crowd pleasing dessert that is simple to prepare the day of or last minute if guests are over! Peel and cut pear into slices. Layer the pear slices, covering the bottom of a baking dish. Rinse and wash the fresh cranberries, then pierce each with a toothpick. Then throw the cranberries into the baking dish, evenly among the pear slices. In a bowl, mix the oats, brown sugar (you may add more than 1/4 cup if you desire), cinnamon, nutmeg and oil together. 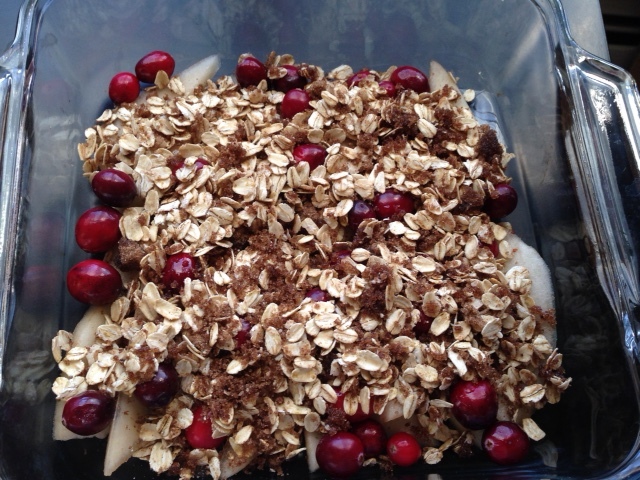 Sprinkle this oats combination mixture over the pear slices and cranberries in the baking dish. Bake in the oven for about 20 minutes. Let cool slightly then serve! Feel free to double or triple the recipe if you like. Since the ripened pears are already sweet, you don’t really need to add too much additional sugar to sweeten the dish. So adjust the sweetness level to what you prefer by the amount of brown sugar (or maple syrup or agave nectar) you add. This crisp keeps for a few days in the refrigerator and tastes delicious cold too!